The structure of the traditional poem “This Is the House that Jack Built” is used as the premise for this Nativity story. The opening pages show Joseph leading Mary and their donkey toward the town of Bethlehem, with a verse from Luke about the birth of Jesus as the text. The following pages begin the repeating pattern with the refrain, “This is the bed where Jesus slept,” followed by “the straw that lined the bed,” “the cow that shared the straw,” and so on. 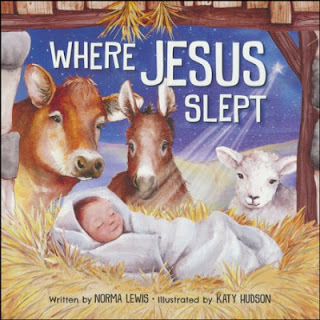 All the phrases repeat with each new character, including Mary, the baby, a lamb, an angel, the shepherds, and the wise men, and a final page includes a picture of a smiling baby Jesus and another Bible verse. The double-page spreads have a greeting-card prettiness, with static poses; the character of Mary looks somewhat unfinished. I have 1 book to give to one of you, just comment below with your favorite Christmas memory, a winner will be announced in 3 days. Also leave your emails so I can email you if you win.